The beautifully crafted Vynebar comes in two sizes, the Vynebar 8 which holds eight bottles, or the Vynebar 4 which holds four bottles. Our Vynebars are crafted using only the finest materials, with robotic precision. We offer these functional pieces of art in various colors and finishes. We have 8 anodized metal colors to choose from. These anodized colors are not paint or powder-coat, they are a chemical bath that colorizes the metal itself leaving you with a permanent finish that will not chip off or fade over time. 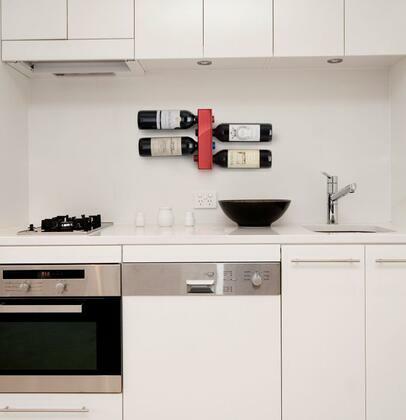 The Vynebar vertical wine rack is built to last. You can also choose from a collection of finishes, which are Glossy Polished, Flat Bead Blasted Finish, or our Classic Brushed Stainless Steel or Polished Mirror Finish to match any decor.